Beautifully engraved certificate from the RMI.NET, Inc. This historic document has an ornate border around it with a vignette of the company logo. This item has the printed signatures of the Company’s Chairman, President and CEO ( Douglas Hanson ). 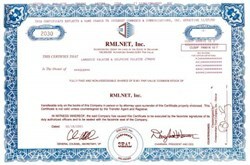 Internet Commerce & Communications (ICCX) was created through the acquisition of Internet Communications Corporation, a network management company, by RMI.NET - Rocky Mountain Internet (RMI), in November 2000. 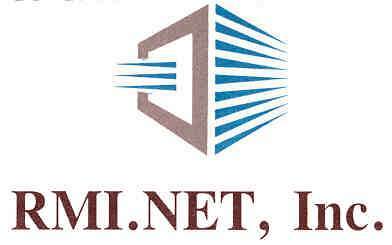 RMI was a regional Internet services provider that began operation in 1994, as Spectrum Online. ICCX focuses on fully integrated solutions for small and medium-sized enterprises (SME's). ICC Speed Cell will continue to specialize in e-business applications, including high-speed Internet connectivity using a variety of wire-line and wireless technologies; web services, including development and hosting; network services, such as Virtual Private Networks; and other telecommunications services. "We strongly believe we can emerge from this proceeding a much stronger and viable company," said Douglas Hanson, Chairman & CEO of IC&C. "As one of the largest investors, I thought long and hard about this decision, but in the end I felt this was the best course of action for our employees, our vendors and our shareholders." On Oct. 31, 2001 - Internet Commerce & Communications (ICCX) and ICC Speed Cell, LLC announced that ICC Speed Cell has purchased the assets of ICCX for $1.1 million plus assumed liabilities.